PPZ NOWAMYL S.A. is the only producer of potato starch and maltodextrine in West Pomerania region of Poland. Producing and treatment of the potato starch in Łobez has already more than 100 years long tradition. In 1898 roku local farmers and other persons connected to agriculture headed by the governor of the Łobez district decided to buy the sugar factory which were closed in 1864. Sugar refinery was perfectly suitable to be transformed to the form of the new plant – a starch factory – because district had then a big surplus in potatoes production. Appropriate equipment has been quickly acquired and producing of potato starch was started. In 1939, just before the outbreak of World War II in the potato starch factory been celebrated the 40th anniversary of the plant existence. As it is apparent from the accounts of former residents of Łobez posted in the newspaper “Labeser Heimatbriefe”, they were very proud of their potato starch factory, that gave them employment and satisfaction, and the surrounding farmers gave the possibility to sell potatoes at favourable prices. Thanks to activity of the potato starch factory, close vicinities of Łobez together with neighbouring districts have become real potato production center. The plant during the II World War ran processing of the potatoes surplus and continued to produce starch. 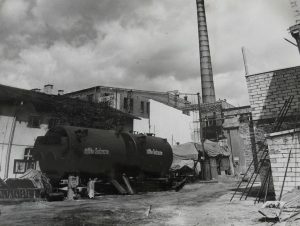 The plant taken over in 1945 was partially destroyed, but already in 1947 began the first Polish potato processing campaign on the Recovered Territories. In the 1970s took place a technological development of the factory through the investment and modernization activities, in the framework of which was carried out, inter alia, such undertakings as: construction of the washing station, modernization of the wet and dry units and production start up in the starch formulations unit. 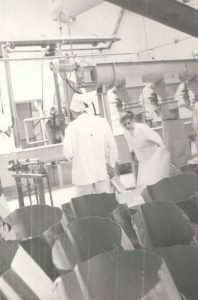 In subsequent years, the plant was systematically modernized and extended and new structures and production units were built, also the machinery and technological devices were exchanged to new. In 2002 modernization of the dry production unit were made, which resulted in an increase in the production, and in the period of 2017-2019 modernization of the wet production unit is planed.